The 3-30 Money Diet is a financial challenge. £30 a week for three weeks. Do you want to save money? Cut your debt? Beat inflation? This money challenge will help you. First published in Money's Big Secret it is designed for individuals and families. There is only one thing you need to remember for The 3-30 Money Diet, and it is simply what it is. I'll say it again, £30 a week for 3 weeks. This is after paying for housing, bills and commuting for work. If all you do is stick to £30 a week everything else will fall into place. It's the best way to force yourself into the deal hunting mindset. Week 2, Day 1... Leaving my cards behind and taking £30 cash + leftover from the week before. Take out £30 cash and leave your cards at home. This is a critical step, more important than any other. If you don't do anything else just do this. Why? It forces you to be money-conscious. You cannot spend money if you don't have it. Leaving your money at home puts you in that uncomfortable situation and that's what The 3-30 Money Challenge is about: learning to thrive in financial discomfort. Pen and paper, rummage through cupboards and turn over the drawers. Make a list of everything edible you have along with every day items. Get to the bottom of the freezer, search at the back of the fridge. Even the spice and herb jars and the long lost John West tin of tuna. Plan your meals ahead, look for cheaper alternatives, seek discounts and vouchers. If you can, switch supermarket. If you're already shopping at a discount retailer, start shopping at multiple supermarkets for the best bargains. Find yellow sticker reduced-to-clear items (see this Chat thread for photos of Yellow Sticker success) and count your pennies. Home cooked or packed lunches are a must. If you keep buying £3 meal deals you will fail. So plan ahead and batch cook. That means preparing your lunches ahead of the week. Every Sunday I cook a roast chicken. I then have a portion every day at work. Others batch cook their dinners, family meals, and I've even seen one Mum cook an entire month's worth of meals in one go. Tattoo NBFP on to your wrist. Put it as the background on your phone. It means Never Buy Full Price and is the cardinal rule of Deal Hunters. Only buy things on sale, stack them with voucher codes, and compare prices. The best way to build a habit of deal hunting is to follow guiding principles. 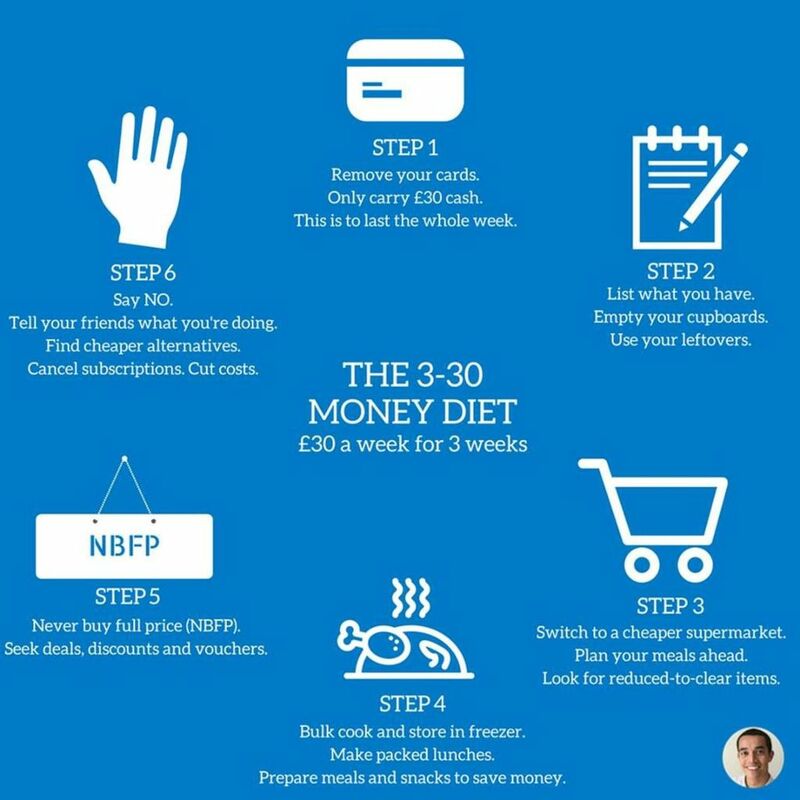 Similar to how the only thing you need to remember for this challenge is £30 a week for 3 weeks, NBFP is the golden method. The one action you can follow and be confident that you're saving money because of it. NBFP! This is the hardest part. On the first day you'll experience withdrawal. Thirsty, hungry, hot or cold? Tough luck. You have to say no to yourself. No to the drink, no to the quick snack, no to the air conditioned or warm cafe. But it passes, day by day, you stop noticing such things. In fact, you start to develop a quiet pride in your strength. You have to say no to friends too. Peer pressure to spend money is the worst. "Hey, want to go for a drink after work? ", "Hey want to go to the cinema this weekend? ", "Hey, we haven't seen each other for ages! Let's catch up over dinner? ", "Hey, you're super hot - want to go on a date?" All of these will blow your budget. Either find cheaper alternatives (there's a chapter on free things to do in How To Live For Free by Deepak Tailor) or say no. The easiest excuse is the truth: "I would love to but I'm doing a money challenge for the next three weeks. Would you like to do [free alternative] instead?" You will be forced to discover how to save money. You will be put into uncomfortable and unfamiliar financial situations. You will save more money and be able to cut debt. You will get out of the Pay Day cycle. You will reset the effects of inflation on your life. You will be initiated into the life of deal hunting! Speak with other members of Latest Deals. You're not alone in trying to save money. In fact, most people are! Perhaps not quite as extreme as us, but that's what makes it fun. Is the £30 supposed to be for one person, so if I'm shopping and cooking for my partner too, that would be £60 between us? That’s what I was wondering. We are a family of 5. Sounds good but for how many?